The driver of an 18-wheeler recently led Elizabeth police on a chase after fleeing the scene of an accident, struck numerous cars, and ultimately caused a crash which killed the driver of the other vehicle. He is now facing multiple criminal charges in New Jersey state court. 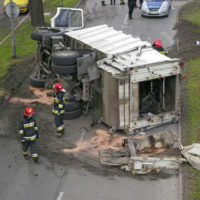 The series of accidents began with a minor accident in Elizabeth. The truck driver, 57-year-old Danny Burnam, was driving near the intersection of First Street and Elizabeth Avenue around midnight when he hit another car. The driver of that car was not hurt and tried to stop Burnam from leaving the scene. Burnam continued driving along Elizabeth Avenue, and in the process was spotted by an off-duty Union County police officer near the intersection of North Broad Street and Elizabeth Avenue. The officer noted that the truck was swerving and moving erratically, and tried to stop him, but could not. The officer fired at the driver with his service weapon, but missed. Burnam continued driving dangerously along North Broad Street, striking what one witness described as dozens of moving and parked cars. By the time he reached the road’s intersection with Parker Road, officers had erected a barricade. Burnam continued driving through the barricade, while being shot at and wounded by police. A half mile from the barricade, Burnam collided head-on with a passenger vehicle. The driver of that car was killed, and his two passengers were injured. Burnam was arrested and treated for non-life-threatening injuries. He was arraigned on charges including aggravated manslaughter, vehicular homicide, and reckless aggravated assault. This story is a tragic example of the harm that can result from allowing individuals with a checkered criminal history to serve as long-haul truck drivers. Burnam, who also goes by the name Danny Clyde Williams, is no stranger to the criminal justice system. Burnam, who has addresses in both Colorado and California, has been arrested at least 54 times, and has been convicted of a felony at least eight times, largely for alcohol and drug-related offenses. His most recent conviction was in 2012. The truck Burnam was driving was registered to Nevada shipping company Dunns Logistics. According to the Federal Motor Carrier Safety Administration, this company has a 28.3% out-of-service rate for driver inspections, more than quintupling the national average of 5.51%. If you or a loved one have been injured in a crash with a tractor-trailer, 18-wheeler, or semi-truck in New Jersey, contact the knowledgeable and trial-ready Wayne personal injury law firm Massood Law Group for a free consultation on your case, at 973-696-1900.